Music education is at the forefront of Capital City Guitars philosophy. We strongly believe that learning to play or advancing your skills will enhance mind, body, and soul. Why musicians have bigger, better brains. Music can improve your mood and reduce stress. The effects of musical training on young brains. How music makes you more creative and productive. 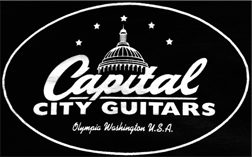 If you are looking to take guitar, bass, banjo, mandolin, or the ukulele lessons; Capital City Guitars provides lessons for every skill level from handpicked professional teachers who work in our store teaching private or group lessons. Teachers are private contractors through our store and payment will be made directly to them. To learn more about our teachers and to schedule a lesson, call us at: 360-956-7097.